Losing important data from your favorite Asus ZenFone could be a very painful experience. You use the newly purchased ZenFone to do all the crucial works and you really depend on the phone much. Retrieving the lost data is a very challenging job and you cannot do anything without taking the help from efficient third party software. Fortunately recovering data for ZenFone is not a daunting task at all. 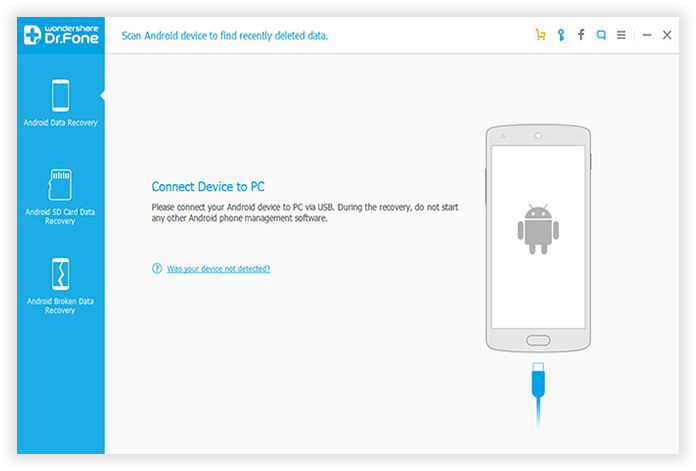 You can find a lot of data recovery software available online and Android Data Recovery is the most popular among them. 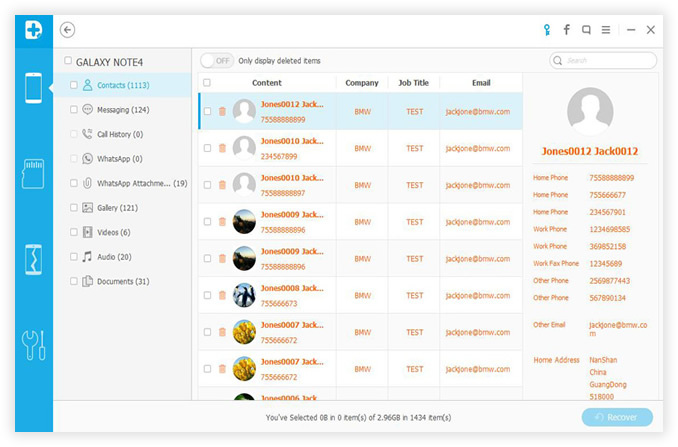 Data Type: Photos, Text Messages, Contacts, Music, Videos and other Documents. ASUS ZenFone: ZenFone 2, ZenFone 2 Laser/Zoom, ZenFone 3/4/5/6. You can simply download the software by clicking the download button. After downloading the software, double click the .exe file to run the software setup wizard. It will take a few minutes to complete the installation procedure. Once the installation procedure is completed, launch the software from desktop shortcut. 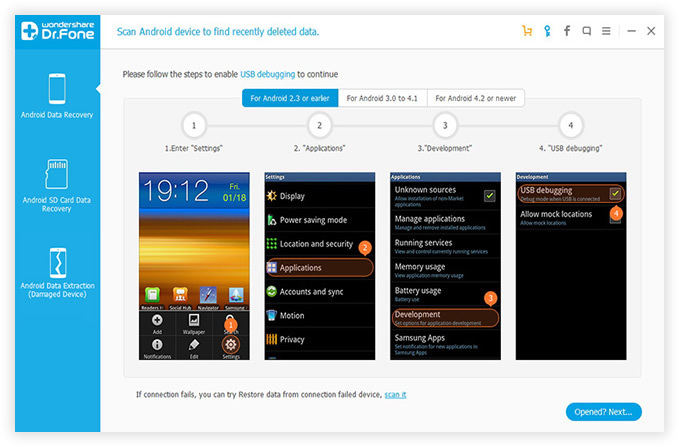 To ensure a smooth recovery process, it is really important to connect your ZenFone to the computer properly so that your device can be recognized by Android Data Recovery. You can connect the phone with the USB cable and don't forget to enable "USB Debugging" on the ZenFone. 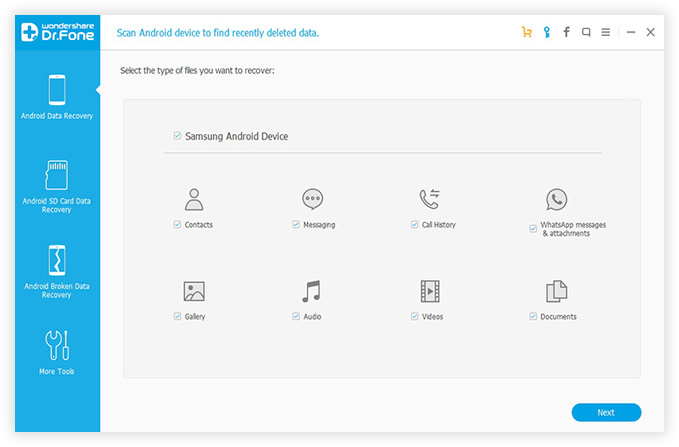 Once the program detects your device, you can easily select the data type that you would like to recover. Now you need to click "Next" to initiate the data scanning process. Please remember that the more file types you select, the more time it takes to scan the deleted files on your phone. So If you just want to recover photos, then choose Gallery only during the file selection. All you need to do is now click the "Start" button to begin the analyzing and scanning process. You can choose one of two options according to your requirement and these two options are: Standard Mode and Advanced Mode. It is always better to start with Standard Mode because it works faster. The entire scanning process takes 10-20 minutes. Once the scan process is completed, you can preview the files one by one. Check the items that you want to recover and click "Recover" to save the selected files on your computer. Now you might have realized how easily you can recover all the crucial data that you have lost from ASUS ZenFone. The entire process is very simple. You can easily download the trial version of the software and it is completely free. No matter what sort of data that you have lost from your ZenFone, you can easily restore it with the help of Android Data Recovery software. And don't forgot to backup your phone to make sure the files are well protected.